What is the Urban Agenda for the EU? 1. The Urban Agenda for the EU aims to realise the full potential and contribution of urban areas towards achieving the objectives of the Union and related national priorities in full respect of subsidiarity and proportionality principles and competences. 2. The Urban Agenda for the EU strives to establish a more effective integrated and coordinated approach to EU policies and legislation with a potential impact on urban areas and also to contribute to territorial cohesion by reducing the socioeconomic gaps observed in urban areas and regions. 3. The Urban Agenda for the EU strives to involve urban authorities in the design of policies, to mobilise urban authorities for the implementation of EU policies, and to strengthen the urban dimension in these policies. By identifying and striving to overcome unnecessary obstacles in EU policy, the Urban Agenda for the EU aims to enable urban authorities to work in a more systematic and coherent way towards achieving overarching goals. Moreover, it will help make EU policy more urban-friendly, effective and efficient. 4. The Urban Agenda for the EU will not create new EU funding sources, unnecessary administrative burden, nor affect the current distribution of legal competences and existing working and decision-making structures and will not transfer competences to the EU level (in accordance with Articles 4 and 5 of the Treaty on European Union). The Urban Agenda for the EU focuses on a more effective and coherent implementation of existing EU policies, legislation and instruments. Drawing on the general principles of better regulation, EU legislation should be designed so that it achieves the objectives at minimum cost without imposing unnecessary legislative burdens. In this sense the Urban Agenda for the EU will contribute to the Better Regulation Agenda. The Urban Agenda for the EU will not initiate new regulation, but will be regarded as an informal contribution to the design of future and revision of existing EU regulation, in order for it to better reflect urban needs, practices and responsibilities. It recognises the need to avoid potential bottlenecks and minimise administrative burdens for urban authorities. The Urban Agenda for the EU will contribute to identifying, supporting, integrating, and improving traditional, innovative and user-friendly sources of funding for urban areas at the relevant institutional level, including from European structural and investment funds (ESIF) (in accordance with the legal and institutional structures already in place) in view of achieving effective implementation of interventions in urban areas. The Urban Agenda for the EU will not create new or increased EU funding aimed at higher allocations for urban authorities. However, it will draw from and convey lessons learned on how to improve funding opportunities for urban authorities across all EU policies and instruments, including Cohesion Policy. The Urban Agenda for the EU will contribute to enhancing the knowledge base on urban issues and exchange of best practices and knowledge. Reliable data is important for portraying the diversity of structures and tasks of Urban Authorities, for evidence-based urban policy making, as well as for providing tailor-made solutions to major challenges. Knowledge on how Urban Areas evolve is fragmented and successful experiences can be better exploited. Initiatives taken in this context will be in accordance with the relevant EU legislation on data protection, the reuse of public sector information and the promotion of big, linked and open data. For further information, please refer to the Pact of Amsterdam. Thematic Partnerships representing various governmental levels and stakeholders are the key delivery mechanism within the Urban Agenda for the EU. The existing Partnerships have been launched in three steps: the pilot Partnerships deal with the inclusion of migrants and refugees, affordable housing, air quality, and with urban poverty ('Amsterdam Partnerships'). The 'Bratislava Partnerships', launched during the Slovakian presidency in 2016, work on circular economy, digital transition, jobs and skills in the local economy, and urban mobility. The youngest generation, established in 2017 ('Malta Partnerships'), is made of the Partnerships on climate adaptation, energy transition, responsible and innovative public procurement, and sustainable use of land and nature-based solutions. In summer 2017, the draft Action Plans from the pilot Partnerships have been shared in a Public Feedback, informing the creation of the final Action Plans. This process of consulting the public will be repeated for the eight other Partnerships in the course of their work in 2018. All stakeholders are invited to register to this website and to subscribe to the newsletter to receive notifications signalling that the Public Feedback is open. On 27-28 November 2017, the CITIES Forum conference organised in the city of Rotterdam brought together various actors involved in urban development at EU, national and local levels including stakeholders such as NGOs, businesses and experts. A European Commission report to the Council published in November 2017 takes stock of the progress of the Urban Agenda for the EU and its Partnerships. The European Commission has launched a new city portal on the Europa website in October 2016, which will work as a one-stop-shop guiding all interested actors through the different policies and instruments in place. 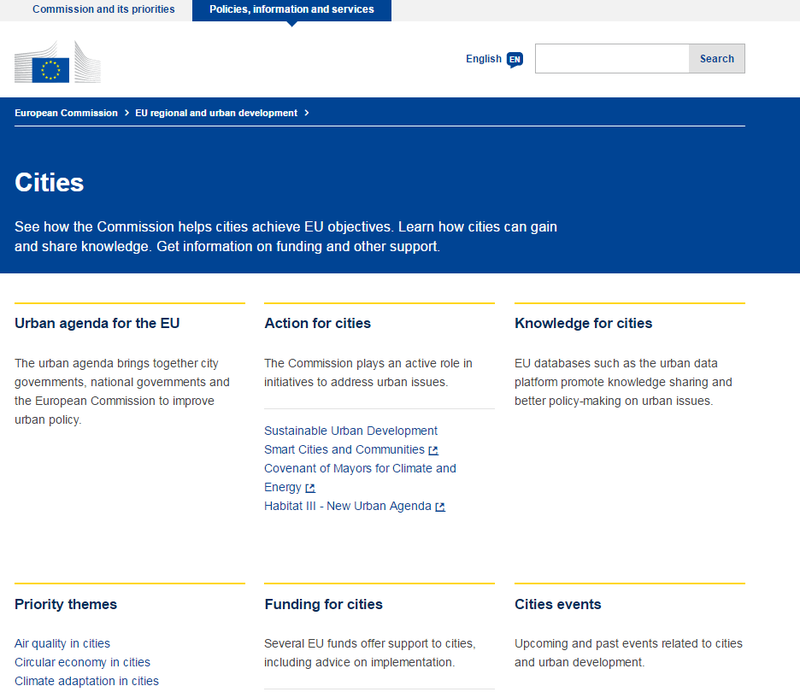 Visit the one-stop-shop at https://ec.europa.eu/info/eu-regional-and-urban-development/cities.